Jennifer Kennedy, MA, NOMCT is blind and works as a cane travel instructor for the Division of Services for the Blind and Visually Impaired of Utah. She talked with us about her recent trip with her husband, Daniel Ashman, to Europe. We talked with her about the differences traveling in Europe versus America as a blind person, and how the public reacted to her confident use of a long, white cane. Q: Where did you travel in Europe and what was the occasion? A: My husband and I started the trip in May in celebration of our three-year anniversary. We’ve been planning this trip for a long time, and always said that the first place we wanted to go was Italy; so we did just that. We then went to Switzerland because his brother is living there now for business, and we ended up in Paris coincidentally because it was easier to have a layover there to get home. I have Italian heritage, and also just love the food and cheese. My husband is an artist and— when you think of the biggest names in art—you think of Michelangelo, Leonardo and Rafael. You go to Italy to see where it all started. We spent a week in Rome, three and a half days in Florence, six days in Switzerland bouncing between Lucerne, Zurich and Basel, and then jetted over to Paris for literally 36 hours. A lot of time was spent making connections, mostly by rail. We didn’t get back on a plane until we left. Q: Even though you describe yourself as a confident traveler and cane travel instructor, did you have any fears going into the trip? A: Well, you assume that we are from one of the most progressive countries and have an incredible amount of law on our side, so when it comes to what accommodations are available and what society expects, you know what you’re getting into. Overseas, the training opportunities are quite different. I didn’t know what to expect, because I didn’t know what the average blind person does in their rehab system over there; we don’t know what services they receive, when they receive services, or for how long. For me, I didn’t want to come across as aggressive, just because I’m used to doing things more independently. I also didn’t want to come across as rude just because I’m trying to do things on my own. My biggest thing was that I was trying not to offend people but maintain some level of independence where possible. In some countries, you know, people are used to someone making decisions for the blind person. So, I was curious to see what would happen when it came to me doing what I needed to do in the restroom, explore somewhere, or ask a waiter about things on the menu. At the same time, I didn’t want to insist on doing something without any assistance and be known as the snot-nosed American who ruined the experience for the next blind person. Q: I saw on your Facebook you got to walk around and use public transportation a lot. What else did you get to do throughout your vacation? A: Something that was very important to me was that we tried a different kind of transportation in every city. Whether it was a public bus, tour bus, river cruise, subway or above-ground train, we tried all of it, even taxis. All I missed was a carriage ride and a rickshaw, and I’m okay with that! On average, my Fitbit said we walked eight miles a day. I needed a vacation after my vacation! We walked through the ruins of the Coliseum and the Greek Forum; we went to Pompeii and saw where Mt. 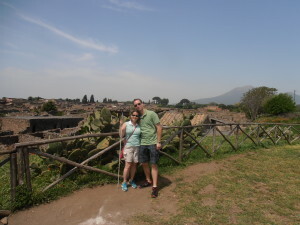 Vesuvius buried the entire city; we went on a walking food tour; a tour at the Vatican; we spent time in the Sistine Chapel; and took some time walking around Florence checking out the different markets. We saw all the stereotypical things you would see in Italy, including the Sistine Chapel painting and the Sculpture of David. You may as well visit all the tourist traps while you’re there, because you don’t know when you will get to go back. In Switzerland, we did a lot of walking in the mountains and enjoying nature instead of the museums and day trips to different cities. We took a cable car up one mountain and walked a trail back down. Zurich was nothing but shopping in markets. In Paris, we had a quick little boat tour and went to the Eiffel Tower. We went to the Notre Dame, and I joked that this was the church tour since we were in a church or walking past one on a tour every day. Q: How was the travel different? A: Italy is tough because it is so old, so you really need to plan ahead. Rome was harder because it doesn’t have intersections the way that we do, and people seem to come and go as they please. The sidewalk is really just a cobblestone median strip right next to the road, so the cars are very close to you. The red lights and signs are just a suggestion, so there were a lot of uncontrolled crossings. The sidewalk was so narrow that we had to walk single-file, so we took turns taking the lead. I didn’t make heads or tails of the address system while I was there; it would take more time and effort than one trip. Since we didn’t have an international data plan, I downloaded walking directions while I was online from Google Maps to get an overview of the route before we went out. We did a hop-on, hop-off bus tour in Paris and Rome. Rather than having to problem-solve to find every location, we could book the tickets and find where the busses were loading. That was very helpful in Paris, where we were only there for 36 hours and didn’t have time to map everything out. Q: Tell me about the dynamic that you and your husband, Daniel, had while traveling. On the one hand, you mentioned that you wanted to explore on your own, but even though your husband is sighted, you still went to Europe—at least I’d hope—to explore as a married couple! A: Typically, there were only two types of instances when we were taking turns leading the way. One was on those narrow streets where we had to walk single-file, and the other was when we were going somewhere to do some shopping, and I wanted to get information from people. In those times, I’d take the lead, because otherwise the default is to talk to the sighted person. In other times, when we were following a tour group, we walked at different paces. I mean, I’m walking consistently with the group and he’s running around taking pictures. It really un-nerved people at first, almost as if they were asking, “Why isn’t he taking care of her?” So, when I would walk, I’d strike up a conversation with somebody else in our group and that seemed to help. Generally, we weren’t walking on our to figure out the entrance to the Coliseum. The only exception is that when we were getting on and off the Metro, I asked him to let me get out in front and see if I could make sense of how things worked. Now, if I was completely on the wrong track, he spoke up, but if I was just asking for directions, he stayed back. And that was really helpful so that I could have those experiences to use with my students. Q: You wrote about seeing braille frequently. What did you notice in particular? A: Switzerland had braille everywhere. There were tactile paths; plus there was braille at the top and bottom of each staircase and escalator in the transit terminals. Inside the train, there were even braille labels for each car and the water closet. There were abbreviations for the different stations and areas, too. Since my brother-in-law lived there, he could tell us what the different abbreviations were for (or you could also read the raised print above it). The subway ticket machines in Italy had braille; I think it was most likely Italian braille since it didn’t have standard English contractions. Switzerland mostly uses German, so that is what I heard spoken frequently along with some Dutch. Aer Lingus, an Irish airline, had their safety pamphlets in UEB. I was excited that I knew the translation differences in UEB, so that was neat to see. There was, however, no braille in most of the restaurants on the bathroom doors, which was mind-blowing since in all the other public places there was braille everywhere. I can’t say if the hotels had labels or not, because I didn’t stay in any hotels while I was there. We stayed in places booked through Airbnb, where you can stay in someone else’s condo or apartment so that we would have an authentic experience. There was not a braille number to be found, so you had to memorize the room and floor numbers. The buttons on the lift did have braille labels, though. We stayed in an apartment where, if you walked around the corner, you could see the Coliseum, and it was only about a 10-block walk away. Most importantly, we had breakfast and dinner at the apartment…and even do laundry. You really want to be able to do laundry; you don’t want to travel with more than 20 days worth of clothes. I don’t know that I could go to Europe and do a hotel after that experience. The buildings we stayed in were hundreds of years old; we had skeleton keys to open them. There were multiple gates and layers to walk through to the flat. Q: How did people react when you, an independent blind traveler, interacted with them? Had they seen blind people before? A: I think lots of people had seen blind people at some point. My husband saw that they were looking at my cane and the way I used it in a way that seemed to show that they knew what the cane was. The long, rigid cane, though, that we use is pretty foreign to them. We saw a couple of blind people traveling independently, and their canes were really short. One blind person used a red and white cane that only came a little above the waist. I suspect he may have come from the Royal Institute. We paid for the Skip the Line Passes because we read it would save some time. We joined the skip line, then, inevitably, a museum worker would see my cane and usher us into an express lane passing everyone. We tried to tell them we are supposed to be in the Skip Line, and the guy insisted, “No, no, you go this way.” Sometimes I won, sometimes not. I didn’t have that problem everywhere, though. They didn’t push me ahead when getting on the airplane, buses and trains. They saw that I would stand or sit where I wanted. I walked up the mountain in Switzerland on the same path, not on the ramp. I never had an issue at the restaurants. They always talked to me, and I could always get the waiter’s attention if I needed. Q: What did you learn and what were your takeaways? A: Plan. Plan and assume something will still go wrong. Having alternative plans and ample cash is crucial. It will take you longer to get things done than you think. Ask the right people the right questions. We had to ask English speakers questions when we found them, because you may not always have an English speaker nearby. For example, the washing machine in our flat was an issue. After we found out how to use it, we couldn’t find laundry soap. They didn’t know what we were asking for in the grocery store. Now, I know that is something you would want to ask the host. I’d also say understand the denominations of money and the conversion rate. Having access to the Internet every night was very helpful because we could research the day ahead. Knowing some of the customs helped a lot, too. For example, in some places, the cappuccinos were much more expensive. We found out that when you sat down instead of taking it to go or sitting at the bar, they could charge you two or three times more for the same cappuccino. And you don’t really tip there. You can leave a few Euros as gratuity in the donation box, especially in family-owned places. Q: What should other blind people know when traveling? A: Talk to other blind people who have traveled; I got some good simple tips from them. Make sure you have key things you may not find as easily other places: extra cane tips, an extra pair of sunglasses if you need them (I had to buy a third pair on a trip to Costa Rica years ago), an extra cane, extra shoes, and a bag that keeps your hands free. I even learned to keep hand-sanitizer, toilet paper and latex gloves, so that I could look around with my hands covered and clean up quickly. It’s important to have a way to contact others. Even though I didn’t have an international data plan, I always had Internet at my main base so I could communicate with people. Conveniently, all the money in Europe is tactile. The bigger the bill, the bigger the amount. Getting the person at the exchange place to count it out will get you an idea of what each denomination is. And I’d say keep plenty of index cards and a slate to label everything and make a note. You won’t always take a device out, so you can slate yourself a quick braille note or instructions more easily. We’ll be posting some more stories from other blind people who have traveled internationally, and we’d love to hear your stories in the comments below.